As telematics solutions are increasingly embraced by businesses across the globe, CalAmp has observed a need for cross-border training on how to develop custom applications for its telematics devices and software that enables IoT for a wide range of verticals. One of CalAmp’s fastest growing markets for IoT adoption is Latin America. On March 28, CalAmp evolved its Customer Training program to present a coaching session tuned to the specific needs of customers and prospects in that region. Hosted in Mexico City, the standard three-day program was transformed into a one-day session, presented in Spanish, and focused on the specific business needs of the local market. Eight different cities of Mexico – Monterrey, Merida, Queretaro, Puebla, Tijuana, Mexicali, Guadalajara and Mexico City – and the country of Colombia were represented by attendees who reported resounding enthusiasm for the regionally-tuned educational opportunity and CalAmp’s forethought regarding the needs of its Latin America customers. Overall, this training demonstrates our commitment to expansion in the region with dedicated and experienced professionals. The goal of CalAmp’s Customer Training events is to make sure our clients get the most up-to-date information on our telematics devices as well as the latest skills needed to leverage all the capabilities of the company’s IoT enablement solutions. Engineers responsible for implementing CalAmp solutions learn about the flexibility enabled by our PEG and PULS tools and how to get the most of CalAmp resources to help bring their implementations to life. Typical Customer Training events provide deep discussions on CalAmp’s gateways, hands on training for advanced scripting and trouble shoots and opportunities to network with in-market engineers tackling similar challenges when building custom IoT applications. 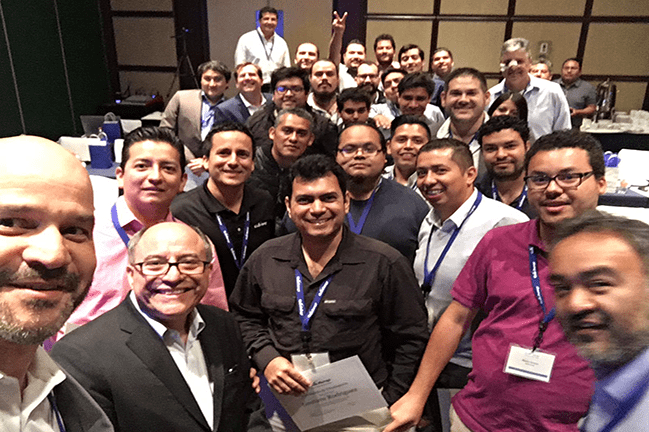 The success of the Mexico City training has inspired plans for CalAmp to host additional sessions in international markets. While those new events are being developed, customers or prospects seeking to expand their expertise with CalAmp solutions may also consider attending one of the intermediate and advanced training sessions in Carlsbad, CA. Additional 2017 comprehensive training class dates include: June 21-23, 2017, and October 2017 (date to be announced).